-1- "Like sands through the hourglass, so are the days of our lives..."
I've been seeing hourglasses in my dreams lately, with sand slipping through at an alarming pace. Have I lost my mind? No, it's just my birthday on Tuesday. Birthdays officially stop being fun after a certain age, methinks. Although, that's not totally true. Mike always takes me to dinner. My parents and in-laws get me thoughtful gifts. People leave me sweet messages on Facebook. :) That's all good. But birthdays have made me introspective the last several years. The older I get, the more I realize how quickly life passes, and that's a humbling thing. One can't help but think: "Am I doing enough? 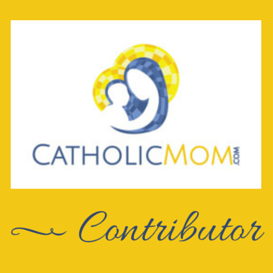 Am I doing what God wants me to do? Am I doing what *I* want to do, such that when I die, I won't feel like I've wasted my life?" -2- "Once upon a time, in a land far, far away, when Tiffany could still remember what she ate for dinner two nights ago..."
And so, I've been thinking a lot lately about creativity. Specifically, whether I have lost my creative edge. As a child, I was always very creative. Not in art class, pray tell. I have zero traditional artistic ability. My poor traumatized art teachers with my deformed stick figure drawings in their hand will be able to speak to that. But I loved creative writing. I wrote stories all the time that people read and enjoyed. Nowadays I couldn't come up with a plot for a fiction novel to save my life. I still enjoy writing, and thrive in it, but creative ideas don't flow as quickly as I'd like. I would like to do *more* writing than I do now, but I'm not certain exactly how to go about doing that. I have no answers here, just questions, but brainstorming about such things is always helpful to me. -3- "Excuse me? Does the library have all of my textbooks?!" This creativity angle applies to my job as well. I like my job, and I chose (finally, thank God) a profession that suits my personality. I work with nice people in a (mostly) soothing and quiet environment that pleases me. I'm able to provide money for my family, and we have excellent benefits. These are all important and good things. But at this point of my career, having achieved my main goal of tenure as an academic librarian, I feel a bit...stale. I don't really do anything new or exciting on any given day. I don't exactly NEED excitement all of the time, but I suppose I'm feeling a bit bored lately. I love being a reference librarian. But there's only so many times that you can point the way to the restrooms or troubleshoot a printing problem before you start to think: "is this what I really saw myself doing with my life?" Certainly, all jobs and indeed vocations come with their less glamorous sides. But am I doing *enough* to reach my full potential as a librarian? As an information professional? As a writer and editor? I don't know. -5- "Can I use this to justify buying a new costume?" In other *good* creative news, I am more in love with dance than ever. I'm happy to be heading back to class this Friday after not being able to attend last week, and my troupe has lots of exciting events and festivals coming up. I also may have a fascinating little gig coming up that has my mind whirling with ways in which I need to improve my improvisation. :) I need to think about making some new performance playlists, and *squeals*! I'm excited. More details on that when I know more, hopefully within the month. -6- "Mommy, is there anything else we can do with...these cardboard penguins?" Poor Henry, genetics are against him when it comes to his own school art projects. Every other month or so he has to do these dioramas, and it's so hard for me to help him with them when I so utterly lack the ability to do anything constructive with felt and pipe cleaners. This week, he had to create a scene from "Mr. Popper's Penguins" and my trip to the craft store resulted in a sad lack of penguin representation, let me tell you. The only thing in the entire store with penguins on it was a roll of duck tape. I cut out individual penguins from that (no easy feat; you know, STICKY) and slapped them onto small circles of cardboard. Voila! Instant herd of penguins. "You know, Mommy, Edward's diorama is REALLY COOL. His has a rock in it with live plants growing off it, and if you press a button, confetti comes out! And his has *12* plastic penguins, AND..."
"Well, good for Edward. You know, we non-crafty people are obviously discriminated against in the K-12 school setting. It really isn't fair." All right, I'll check in with you all either Monday or Tuesday. Have a great weekend, and Happy Valentines Day! 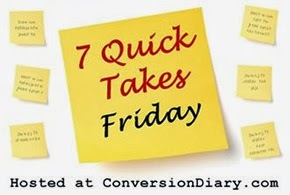 More 7 Quick Takes over at Conversion Diary! Dancing and knitting are both plenty creative! Seems like you've got lots of creative outlets in your life. I find that when I spend some time writing every day, the words and ideas just come faster and faster, whereas when I don't write for awhile, they all dry up. So if you want to get back into writing, come up with a story -- no matter how silly the idea sounds -- and just spend some time every day working on it. I guarantee better ideas will start coming. Early happy birthday, and here's to more dancing and martinis in the coming year!